IRELAND’S popular Olympic medallists of two years ago Gary and Paul O’Donovan are coming to Australia. The brothers are taking part in the Sydney International Rowing Regatta, an event that attracts elite athletes from around the world. They will be joined by Mark O’Donovan (no relation) and Shane O’Driscoll, who are world champions. 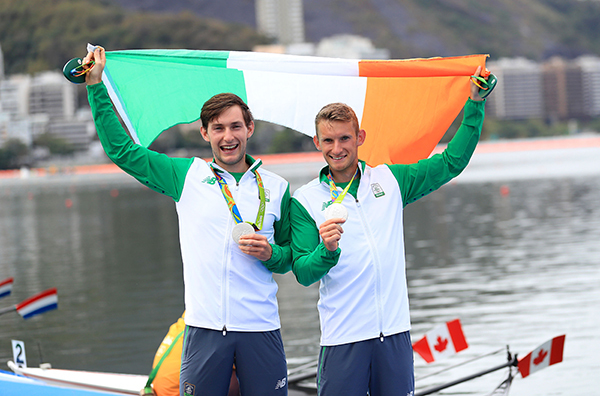 Gary and Paul O’Donovan, from Lisheen near Skibbereen in West Cork, took silver behind France in the lightweight double sculls, winning Ireland’s first rowing medal at the Olympics. Along with Annalise Murphy’s silver in sailing, these were Ireland’s only medals of the Rio games. However, Gary and Paul came to prominence for their hilarious interviews as much as their athletic success, with people all over the globe warming to their personalities, broad accents and quirky humour. Talking in Rio, they discussed their steak diet, the awkwardness of doping tests and missing out on the party for their triumph back home. The brothers have even been invited onto Graham Norton’s celebrity chat show with their motto “pull like a dog” finding its way into the vernacular. Last year, the brothers won silver in men’s lightweight double sculls at the European Rowing Championships. They also won silver at the second World Rowing Cup regatta of the season in Poland in June and bronze at the third in July. In September 2017, at the World Rowing Championships in Florida, Paul O’Donovan won gold at the lightweight men’s single sculls. Mark O’Donovan and Shane O’Driscoll, also from Skibbereen, took gold in both the 2017 European and World Championships in lightweight coxless pairs. The Irish quartet have been preparing in New Zealand where they have been competing in the national rowing championships at Lake Karapiro where Paul O’Donovan took bronze in the single sculls and the foursome also took bronze in the Premier Four. The Sydney International Rowing Regatta takes place at Penrith in the western suburbs of Sydney from March 19 to 25. To find out more, click here.